You've heard that retargeting can work well... but how do you decide how to slice up your website visitors? Let's break it down. Getting started with display advertising on platforms like Facebook and Google can be intimidating, there’s no doubt about it. With thousands (if not millions) of targeting combinations, how do you choose the right one for your business? After analyzing tens of thousands of clicks across dozens of accommodation brands, I can say with confidence that one targeting option stands out ahead of the rest: retargeting. Using the Facebook Pixel or Google Analytics tag, you can create audiences as simple as those who’ve been on your website in the past 30 days or as complex as narrowing down by page, search page depth and time spent on site. This targeting has proven to be easy to setup and drives highly relevant traffic that books. To drive forward your understanding of how to setup retargeting, I present to you the BuildUp Bookings Retargeting Visual Map. I’m not saying targeting people who haven’t interacted with you can’t work: rather that targeting cold traffic on Facebook requires a totally different approach. For those guests or potential guests that have never heard of you or your brand before, you’ll want o first engage/inspire/educate. This can take many forms, but typically cold traffic is best served with a glass of engagement content – a photo, video or content-rich article that aims to earn a click/view/share. Once a guest has engaged with a piece on your Facebook page (for example), you can take those website visitors and move them into the next stage. A potential guest who’s visited your website once is much more qualified than cold traffic — it’s likely they were on your website for a good reason! Unless your site attracts lots of irrelevant traffic (a good example here may be blog posts that have a high bounce rate), this is often the best audience to start targeting on Facebook and Google. Drive-by Website Visitors can be targeted on both Facebook & Google with ads aimed at driving back that guest to your website. You can be somewhat promotional with these ads and offer specials, photos of properties and urgency CTAs. I’d highly reccomend experimenting with different lookback windows (for example, 7 day, 14 day, 30 day and 90 day visitors) to find the best-performing option for your business. Now we’re cooking with gas — targeting highly engaged traffic can prove to drive the highest conversion rates. A highly engaged guest is one that is very far into their rental planning process. For example, they’ve been to the checkout page or on 3+ property or room pages. Those spending 5+ minutes in a single browsing session also tend to be very highly engaged and ready to book as well. Here you can be the most aggressive with targeting – offering promo codes or other discounts to seal the deal when needed. 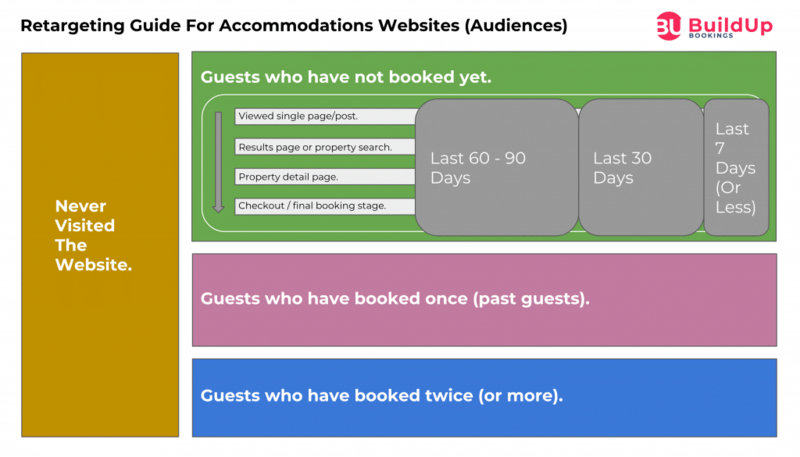 Next we’re taking a look at past guests — these leads can provide highly targeted traffic, but are they likely to book again? One factor that impacts rebook rates is the accessibility of each destination. A drive-to market with guests coming in from 100 miles away may have a 35% rebook rate while an long-flight-away Island may have 5% or less. In other words, rebook ads don’t work for everyone. If they’re a good fit for your business, you can create specials and offers in your ad copy to increase clicks and bookings. For example, “Use promo code WELCOMEBACK at checkout to save $50 on your stay”. Finally, the final audience that we can leverage with retargeting is our loyal guests. These guests have stayed at least twice over in any property and are highly likely to return. Targeting loyal guests means you probably don’t have to be overly promotional — instead you want to careful nudge the guest with branding and awareness messages. For example, the engagement ads we mentioned in the cold traffic section can drive lots of awareness from your loyal guests too. You can start anywhere, but I highly reccomend Website Visitors as your first retargeting set. Install Google Analytics/Facebook Pixel into your website and create a 30 day & 7 day audience. After there are 1,000+ visitors tagged for Google and 200+ tagged for Facebook you can start your ads!